A bounty of healthy grains and seeds matched with rich and sweet roast pumpkin, this salad makes a perfect side dish or hearty lunch. Packed with protein and flavour, this dish has it all. Pepitas add a crunch to the salad, which is bound by textures and colour. You can reserve the seeds from the pumpkin, roast them and add them to the salad. I love these ingredients; I have them every day, whenever I can. I tuck pumpkin into salads and soup, and pepitas and other seeds into my three-grain Be Natural porridge every morning. 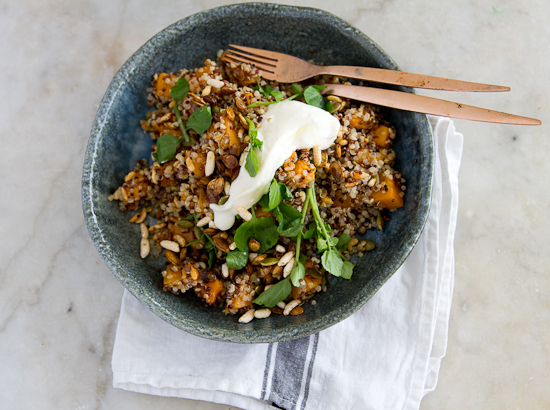 But here's my recipe for pepita and grain salad with pumpkin and a creamy tahini dressing. 1. Preheat oven to 200C. Toss the pumpkin with 2 tablespoons of olive oil and a pinch of salt on a baking tray lined with baking paper. Roast until soft, about 15-20 minutes. 2. To cook the quinoa, rinse thoroughly in a fine mesh strainer. This eliminates a strong bitter flavour that coats the quinoa naturally. Place quinoa, water and a big pinch of salt in a small saucepan over a medium high heat and bring to a boil. Lower the heat, cover the pot and cook until liquid is absorbed, about 12-15 minutes. The little spiral in the quinoa should be quite visible. Turn off heat and let quinoa sit 5-8 minutes. Use a fork to fluff the quinoa and set aside. 3. If using dried pepitas, heat a medium frypan over a low heat and dry toast the pepitas until they start to crackle in the pan. Set aside to cool and mix with the chia seeds and puffed brown rice. If using fresh pumpkin leaves, place seeds on a baking tray lined with baking paper, drizzle with olive oil and sprinkled over a large pinch salt. Roast in oven 10 minutes, until crispy and golden. 4. To make the dressing, combine lemon juice, tahini and yoghurt in a bowl, add about 1 tablespoon olive oil and whisk with a fork. 5. 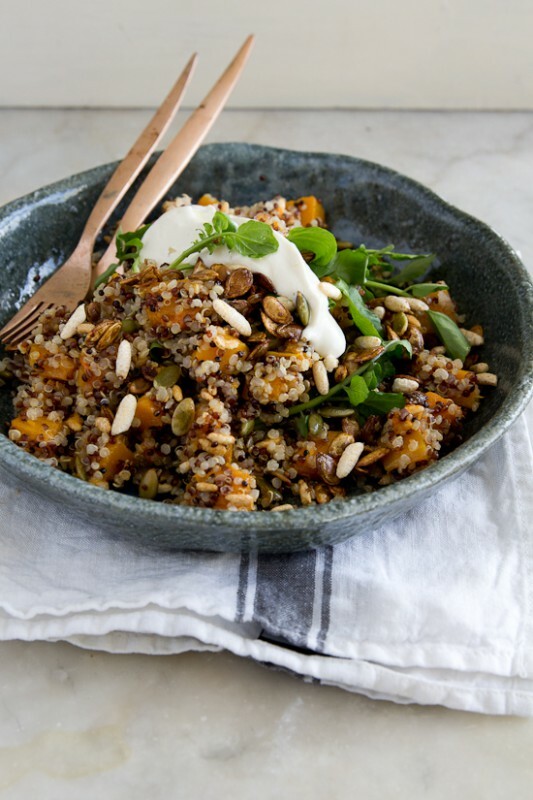 In a bowl, toss together quinoa, pumpkin, pepita mixture, eschallots and watercress. Season with salt and freshly ground black pepper to taste and toss together well. Drizzle over as much dressing as liked and add a bit more lemon juice if you think it needs it. I’m delighted to be working with Be Natural to experiment with a few seasonal ingredients – from pink lady apples to chia seeds – bringing them into recipes and some (hopefully inspirational) posts. See another here!